Cocktail parties without cheese are like days without sun. Like pancakes without syrup. Like watching Toddlers and Tiaras without throwing up in your mouth. But how does one tell the varied cheeses apart? Certainly, one could obtain a slate cheese slab and write out the names in chalk. 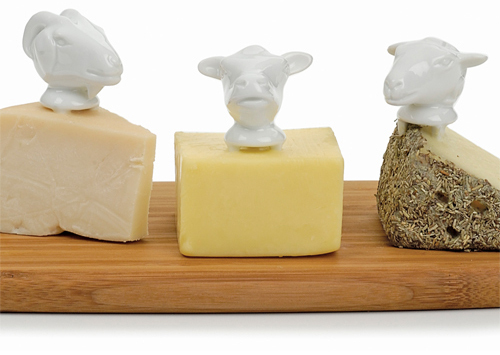 However, I find it much more satisfying to jab porcelain animal heads into the cheeses to denote their animals of origin. PS: Have you entered the TNS 4th anniversary giveaway yet? There’s still time! Love these! As one devoted to cheese – and, alas, highly allergic to goat milk, and consequently, chevre – this is awesome. Awesomeness and disembodied heads – Monday could not get better!